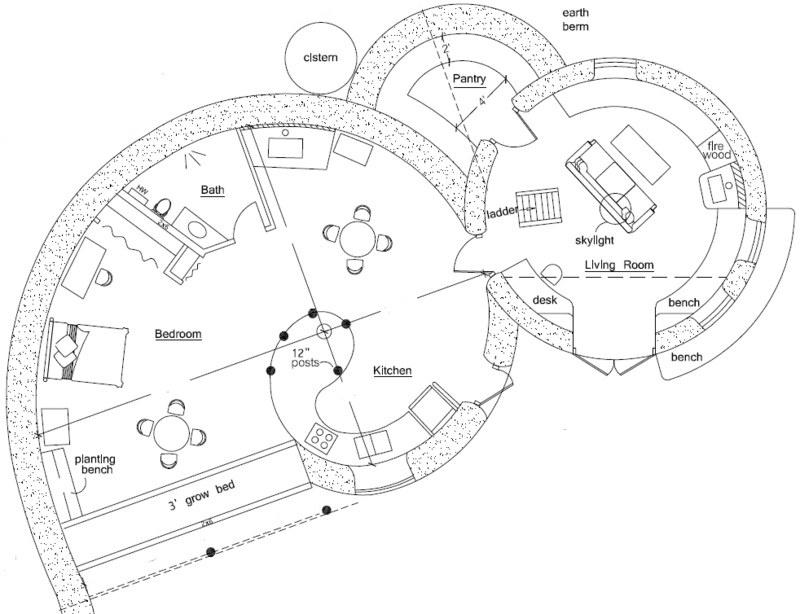 Description: This highly unique home combines the Peace Dome and Spiral Houses, which are also available separately. But by combining them it really creates a truly exciting design. Description: Based on ancient Native American designs, this earth lodge with living roof will keep you cozy and warm even in the harshest climates, because it is compact, earth-sheltered, insulated and uses wood heat. South-facing windows and skylight over the kitchen ensure ample daylighting. It can be built for about $2,000 assuming wood poles are gathered locally. Building basics: This hexagonal structure consists of earthbag walls, about head high, and a wood framed wall on the south. Six large center poles with timber beams support sloping roof poles and living roof. To reduce risk of moisture problems, it’s best to build above grade and add earth on top of the structure rather than digging below grade. 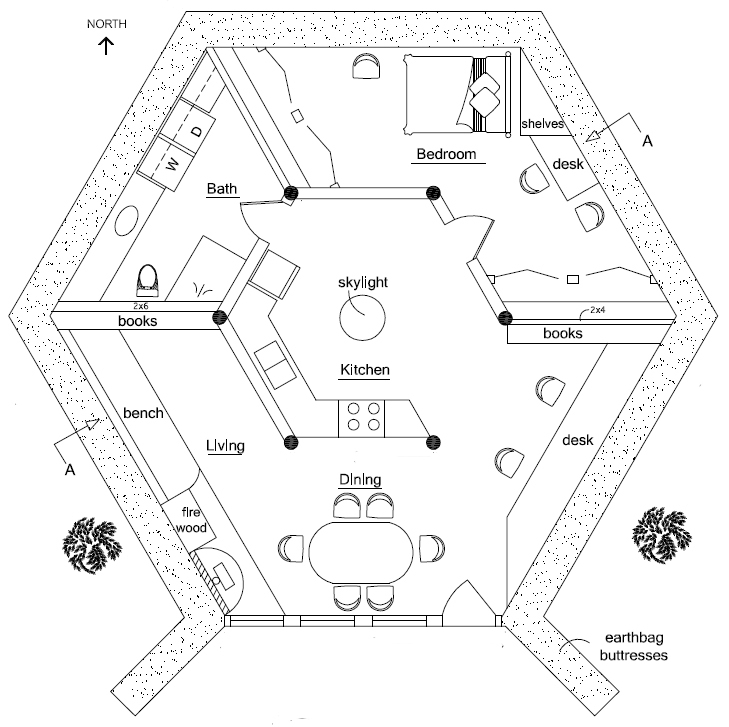 Description: Spiral 2 is a variation of my first spiral house — Spiral Earthbag House. 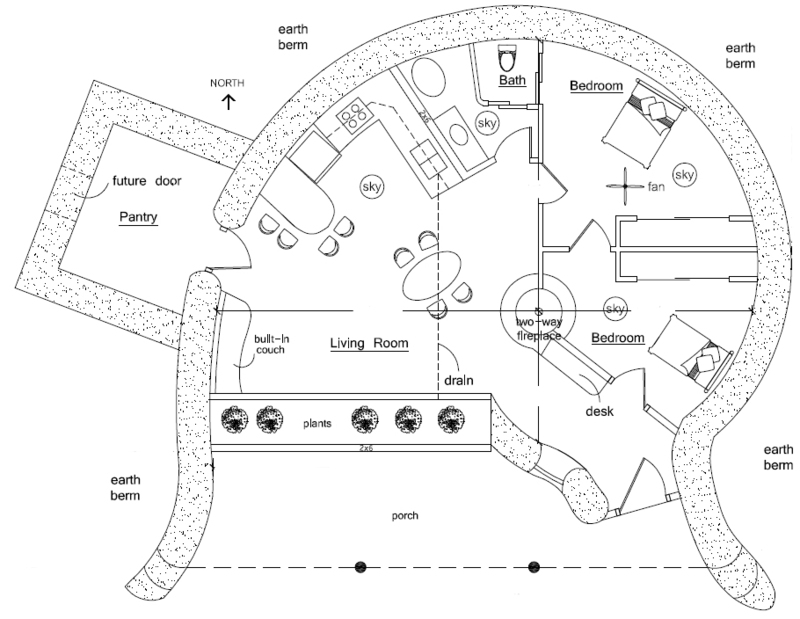 This unique, almost Hobbit-like earth-sheltered spiral design includes a large grow bed, exposed timber ceiling and living roof. Ample light is provided by the window wall next to the grow bed, window and door glazing, and suntubes. Distinguishing features include two bedrooms, masonry two-way fireplace, covered porch and cool pantry for storage of food (no electricity required for refrigeration). An alternate roof plan is available for building with TJIs where wood poles are not available. There’s even a door planned in for future expansion. This home meets zero energy standards, and is now one of my favorite. Description: The main characteristics of this house include efficient use of space, while offering basic necessities and a few extras like a wood stove, good-sized computer desk and excellent passive solar design. Description: Ideal for urban or rural areas, this cozy cottage is the right size for new families, or for retiring couples who want to downsize. Features include a laundry room with mop sink and closet, kitchen island with breakfast bar, built-in bookcases/entertainment center, wood stove, on-demand water heater and a pleasant dining nook. The finishing details can be modified to match a wide range of architectural styles. 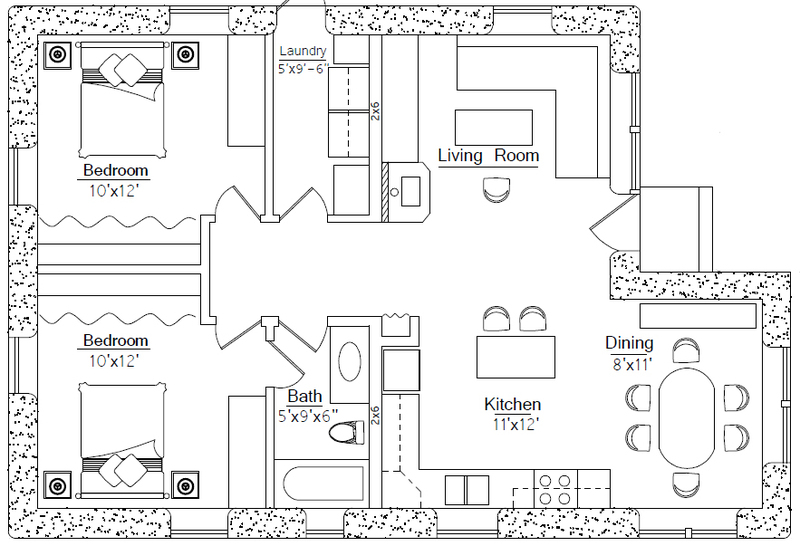 Specifications: 1,275 sq. 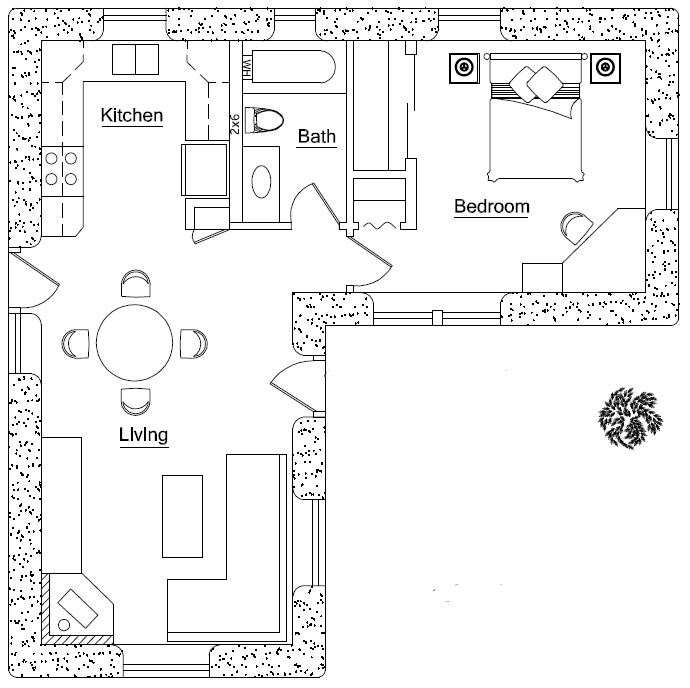 ft. interior, 2 bedroom, 2 bath, Footprint: 36′ x 73′ not including cisterns or optional survival shelter. 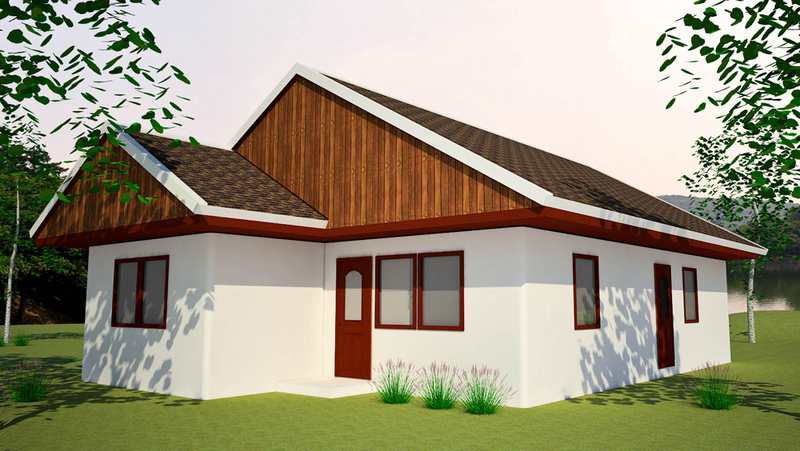 Description: Zero Energy Two is a two bedroom version Zero Energy home. This revolutionary design features zero net energy use, extremely low ‘near zero’ embodied energy and extremely low cost of around $10/square foot (cost of shell, excluding energy systems). This design is the result of years of research in energy efficiency and low cost, alternative building methods. Note: If you want extra space for more bedrooms, etc. then I suggest adding a basement. 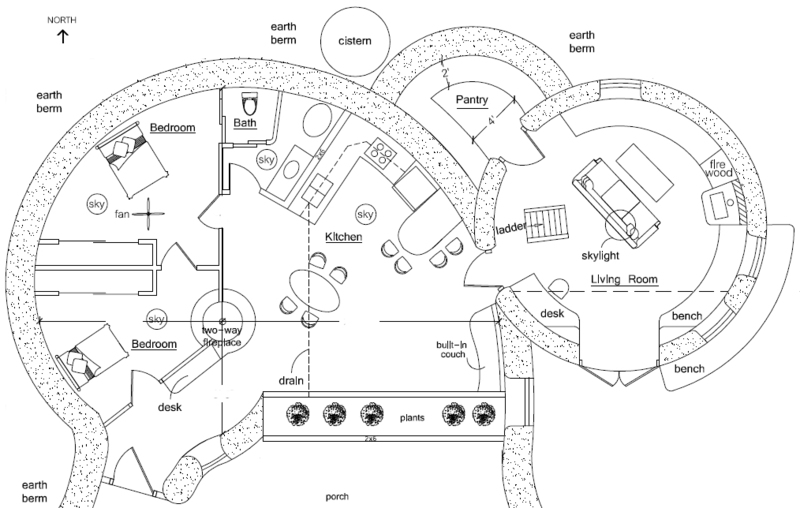 A full basement design is in the works and will be available soon. Description: Like other tiny houses, Tinyville provides just the basics in a compact space. 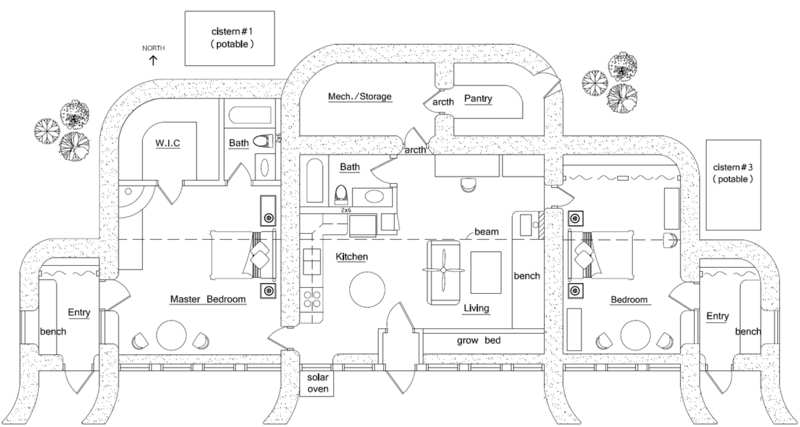 It is intended as a starter house for those with little or no building experience and very little money. This design joins a 13′ interior diameter main dome with loft and a 10′ interior diameter small dome, with a vaulted passageway.